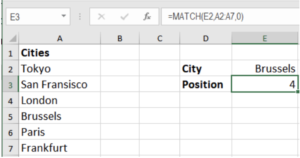 MATCH is a lookup function in Excel that searches for a specified item in a range of cells. It returns the relative position of the item in that range. The range can be a row or column. The Match function can be used to perform an exact lookup, approximate lookup for values that less than or more than the lookup value in a sorted list, and wildcard lookup for any letter in a text lookup value. In this tutorial, we will show you in detail how to use MATCH function with examples. 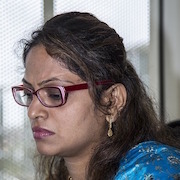 lookup_value: This value is required. It is the value that you want to match in the lookup_array. 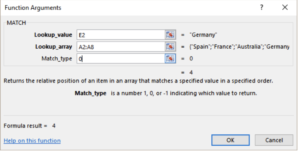 lookup_array: This value is also required for a MATCH function to work. It is the range of cells we search the lookup_value in. 1(default) Finds the largest value that is less than or equal to lookup_value. The values in the lookup_array argument must be placed in ascending order. 0 Finds the first value that is exactly equal to lookup_value. The values in the lookup_array argument can be in any order. -1 Finds the smallest value that is greater than or equal tolookup_value. The values in the lookup_array argument must be placed in descending order. The MATCH function returns a numeric value. If it does not find a match, MATCH will return a #N/A error. The MATCH function is case insensitive. That means it does not distinguish between upper and lowercase when searching for a match. MATCH does not return the value of the lookup, it returns the actual position within the lookup_array. 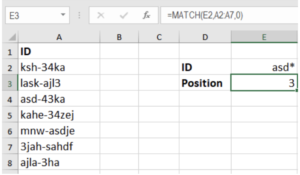 If the match_type parameter is 0 and the value is a text value, then you can use wildcards in the lookup_value parameter. In the following examples, you will learn how to use the MATCH function in Excel. Click on cell E3, which is the location where the result will be displayed. 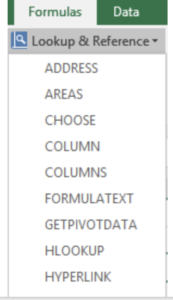 Choose Lookup and Reference from the ribbon to open the function drop-down list. Click on MATCH in the list to bring up the function’s dialog box. In the dialog box, click on the Lookup_value line. Click on cell E2 in the worksheet to enter the cell reference into the dialog box. Click on the Lookup_array line in the dialog box. Highlight cells A2 to A8 in the worksheet to enter the range in the dialog box. Click on the Match_type line in the dialog box. Enter the number 0 on this line to find an exact match to the data in cell E3. The number 4 appears in cell E3 since the term Germany is the fourth item from the top in the countries list. When you click on cell E3, the complete function =MATCH(E2,A2:A8,0) appears in the formula bar above the worksheet. MATCH performs an exact match when match_type is set to 0. 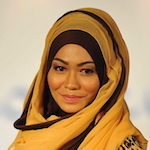 The values do not need to be sorted in order for an exact match to work. In the following example, assign the formula =MATCH(E2,A2:A7,0) to cell E3 to find the position of Brussels. MATCH here has 0 as match_type and performs an exact match. MATCH performs an approximate match when match_type is set to 1. The values need to be sorted A-Z for this approximate match to work. MATCH will find the largest value equal to or less than the lookup value. =MATCH(E2,A2:A7,1) to cell E3. This will return position 4 which is the largest value equal to or less than the lookup value. When match_type is set to 0, MATCH can perform a match using wildcards. In the example shown below, to find the position of the ID starting with asd*, assign the formula =MATCH(E2,A2:A7,0) in cell E3. This will return the position 3 containing the ID asd-43ka. Referring to the previous example, to replace #N/A errors in the MATCH function, assign the formula =IFERROR(MATCH(E2,A2:A7,0),"Incorrect Lookup Value") to cell E3. Cell E3 now returns Incorrect Lookup Value as the lookup value in cell E2 KJL* does not match with any of the values in column A.
Hello. Can you help me with a match function in excel? Use a VLOOKUP function to return the proper amount in C8, making sure to specify an "Exact" match in the function. In cell H12, add an INDEX function that will use the Dept named range as the array associated with a MATCH function to determine the lookup array for the longest call referenced in H11 from the Call_Length named range with an exact match. In cell H13, add an INDEX function that will pull the satisfaction rating associated with a MATCH function to determine the lookup array for the longest call referenced in H11 from the Call_Length range with an exact match.